India’s rural population is now gradually being included in the national healthcare system. Burdened by high maternal and child mortality, frequent occurrences of waterborne diseases, chronic hypertension, acute respiratory infections and systemic anaemia among women, the villagers are in serious need of medical attention. Although basic infrastructure is in place throughout the country, the reconciliation between villagers and government services remains an ongoing challenge. Amrita SeRVe focuses on preventative measures and health education. By understanding the causes of diseases, risk factors can be controlled and reduced. The simple practice of handwashing before eating food, for example, can cut down the rate of waterborne infections dramatically. A large number of pregnancy related complications, on the other hand, can be avoided by visiting a health centre for antenatal check-ups. Similarly, proper immunisation can also eliminate the prevalence of several diseases. A big attributor to good health is a balanced and nutritious diet. At present, many families cannot afford to purchase nutrient-rich grains and vegetables on the markets and suffer from mild to severe malnutrition as a consequence. To combat the shortage of healthy food, the cultivation of home kitchen gardens is not only promoted, but also supported in implementation through practical instructions delivered on-site by our staff living in the communities. In essence, Amrita SeRVe supports the people in adopting a range of practices that secure the well-being for all, making use of existing infrastructure and resources, primarily through raising awareness and conducting frequent follow-up. 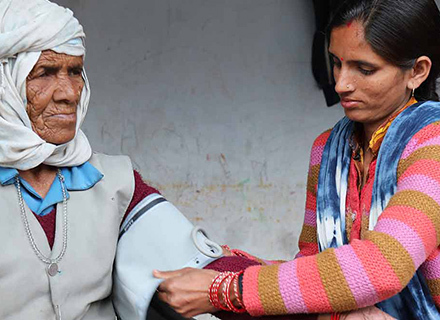 At the heart of all health-related activities are the local women in each village who have been identified by Amrita SeRVe to serve as health workers. Their main role is to spread relevant awareness on health-related topics, provide basic health support, as well as to improve the usage of existing government facilities. Amrita SeRVe health workers are female, have completed basic schooling through the 8th standard, and reside in the same or neighbouring village. The health workers are always available and present within the community. They are females because it is easier for women to reach out to pregnant women and adolescent girls. One of the health workers’ regular tasks consists of visiting between four and eight homes every day. This way, each household in the community is visited at least once a month. Active health workers are engaging with families to promote good health practices and to explain the risks and symptoms of several common diseases such as severe diarrhoea, pneumonia, anaemia and vitamin deficiencies. At the same time, they are constantly looking out for indications of any such diseases in the families. Health workers are trained in giving awareness classes and learn how to spread knowledge effectively. In addition to sharing their knowledge during daily home visits, the health worker holds regular awareness sessions at schools, in Anganwadis and at Self-Help Group (SHG) meetings. 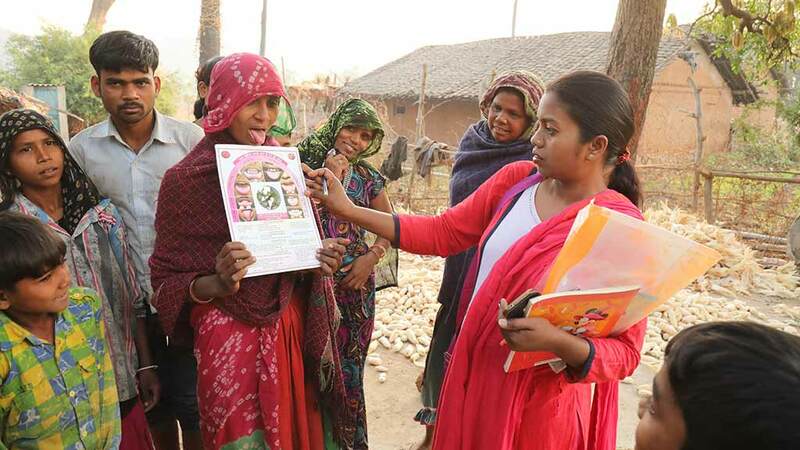 At least twice a month, health workers join SHG meetings to spread awareness about new practices to their members, who then pass these on, thereby setting an example for the whole village. Self-cleanliness and hygienic practices such as handwashing and body care are properly explained. Other topics include the perils of open-defecation and the advantages of the proper use of toilets, nutrition, substance use, menstrual hygiene, home remedies, night blindness and the identification and treatment of common diseases. On special occasions such as Menstrual Hygiene Day, Doctor’s Day, and Health Worker’s Weekend Women’s Day, rallies are organised to add momentum to the health movement. When health workers visit government schools to meet the children, they not only discuss health topics, but also give live demonstrations. They teach personal hygiene through practicing cleanliness activities in mixed groups with small and older children. At the same time, they regularly monitor the children’s cleanliness in terms of hand washing, trimming of nails, combing hair, bathing and wearing of clean clothes. Essentially, the health workers are the link between the villagers and professional healthcare. If a health worker recognises anything unusual or troubling, she will immediately refer the person to a doctor at the Primary Health Centre (PHC). Sometimes health workers even accompany people to the PHC, when they are too weak or intimidated to go by themselves. PHCs are the first point of contact between the village community and the medical officer, and they provide basic medical services. Patients with higher requirements are referred from there to the nearest Community Health Centre (CHC) or even the District Hospital, which in most cases is much further away. Health workers especially keep a close eye on pregnant women. They follow up on their well- being and preparedness either during their routine or additional visits. They maintain a care record for each pregnant woman and advise her to visit the PHC once a month to receive a free antenatal check-up, immunisations and iron supplements. During her visits, the health worker also reminds the women to regularly take any supplements prescribed by the doctor and to complete preparations for delivery in good time. After delivery, health workers check on the mothers and their newborns. Aside from verifying that both are in good health, they ensure that the first immunisations are given on time and that an official birth certificate is issued. Health workers have also handed over new-baby kits containing essential items and supplies to ensure the baby’s comfort and wellbeing. The kits include one set of baby clothes, oil, soap and other essential items. Additionally, health workers actively support the government appointed ANM (Auxiliary Nurse Midwife), ASHA (Accredited Social Health Activist) and Anganwadi workers. During immunisation camps that are conducted by the ASHA worker once per month as per government directive, our health workers offer support in its organisation and ensure that not a single child is overlooked. In many villages, people are not used to seeking the help of professional doctors when they fall ill. As part of efforts to promote full use of free government health services, usually provided at the nearby Primary Health Center (PHC), Amrita SeRVe encourages regular medical camps in the communities. Ideally, these camps are run by the medical officers and support staff from the PHC itself. Health workers play a role in organising the location as well as mobilising people to attend. Health workers and village coordinators assist people in availing government schemes like pensions, health insurance and social security. For example, there are several Central Government schemes specifically for mother and child care, and people living below poverty line. They also support people in applying for Aadhar cards and in opening bank accounts—both of which are now requirements for most government schemes. For the most part, villagers are unaware of the large number of schemes for their benefit. In order to address the deficits arising from malnutrition, health workers initiate, promote and monitor kitchen gardens in the villages. These may be located in homes, schools or a public community area. By growing their own food, villagers can meet their nutritional needs of essential vitamins and minerals. Health workers and village coordinators have been trained to facilitate regular yoga practices for groups of children and adults. The yoga sequence consists of Surya Namaskar and simple asanas combined with breath awareness and concluded with meditation. The sessions for children take place either before or after school while those for adults are usually conducted together with SHG members.